Westinghouse 65” Fire TV LCD - $? The LG E7 won in all three categories, and was again crowned ‘King of TV’ in the Shootout. Sony A1 received honorable mention for coming close to LG E7, according to AVSForum who attended the event. The TV Shootout is something that home theater hobbyists and video aficionados look forward to every year. For more than a decade, Robert Zohn, owner of Value Electronics, has put the top performing TVs from various manufacturers into a room, brought in professional TV calibrators and invited customers, enthusiast and journalists to rate the sets on a variety of different criteria. The winner has been crowned that year's "King of TV." This year the show organizer purchased the TVs at retail (except the Sony LED/LCD and Westinghouse sets which were manufacturer loaners). As with previous years, expert calibrators Joel Silver and Kevin Miller made sure that all of the sets were calibrated to perform their best. Joel is the founder and president of the ISF (Imaging Science Foundation), and Kevin is a well-respected industry consultant and President of ISFTV. Unlike previous years where regular folks (customers and hobbyists) voted to determine the winner, this year a panel of independent expert judges with experience in content creation and video mastering were the only ones who got to cast the votes. The categories included studio lighting/home theater performance, HDR and bright room performance, and streaming performance. This last one is actually fairly important as streaming is where most of the current 4K/HDR content comes from these days. The "home theater performance" category was broken down into multiple sub-categories, looking at perceived contrast ratio (40% of the total score), color saturation and color volume (20%), colorimitry including grayscale tracking, gamut coverage, and saturation (20%), and motion artifacts/perceived lag (20%). The contenders included the usual suspects: Samsung, Sony, LG and VIZIO, with newcomer Westinghouse providing one of their UHD models as well (though it didn't perform well in such lofty company). The specific models in the running this year all measured in at 65 inches (diagonally). In a surprise to virtually no one, LG's OLED65E7P OLED TV scored at the top of each category, winning the shootout for the fourth year in a row. 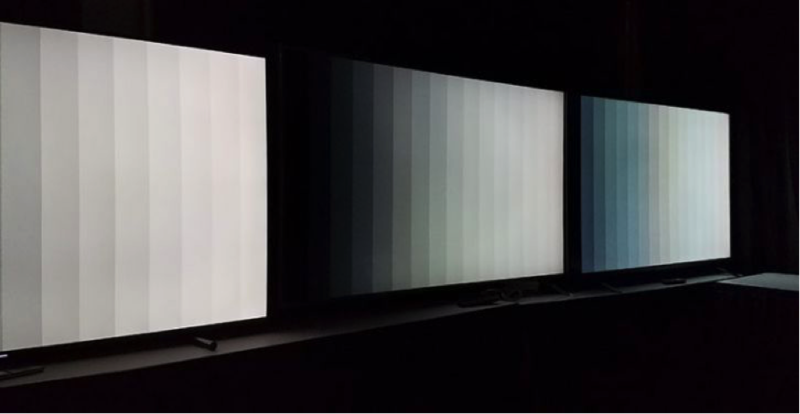 Although LED/LCD sets (particularly the Samsung and the Sony) are capable of getting much brighter than the OLED TVs, the OLED's inky blacks and deeply saturated colors won the day. The Sony XBR-65A1E (which uses an LG OLED panel, married with Sony's own video processing) put in a strong enough performance in the Studio Lighting/Home Theater category to earn that set an honorable mention. The VIZIO P65E1 put up a decent fight, particularly considering its price point, but the Westinghouse was clearly out-classed. But at $650, that result is not unexpected. LG's premium OLED TV also topped evaluations by consumer magazines in five European nations. LG's OLED TV scored 77 points in an evaluation by Spain's OCU Compra Maestra, the highest among 189 models surveyed. Consumentenbond, published by a Dutch consumer association, gave it eight out of 10, putting it at the top among 210 products. Sweden's Rad & Ron studied 215 products and gave the LG TV the highest mark of 80 points, while Belgium's Test Aankoop and Portugal’s Deco Proteste placed it at the top among 211 and 236 TV models, respectively. LG has expanded its share of Europe's high-end TV market, where a TV costs US$2,500 or more, from 38.7 percent in 2015 to 57.4 percent in 2016 and 63.4 percent in the first half of this year.